I am very excited to share with an interview with Bhai Harlove Singh from Sacramento who is nearing culmination of a beautiful "62 Raag Gurbani Kirtan" CD set, the first of its kind finished in the US. Bhai Harlove Singh, along with fellow young musicians from Sacramento California, have recorded new compositions in all the 62 raags in the Guru Granth Sahib. Compared to the 31 raag compositions, like Dr. Gurnam Singh's compilation, this compilation also includes the 31 mishrat raags in addition to the 31 main raags. While the volume of the project is by itself impressive, from the demo it is clear that the quality of the music and recordings is equally impressive. The promo videos and an interview can be found below. My solemn request for the entire Sikh Sangat is to generously buy the CD sets with enthusiasm and provide encouragement for the musicians with your comments. This will encourage current and future generations of kirtaniyas. Can you tell us about your training in Gurmat Sangeet? I have been learning for 5 years. I formally began learning in 2011 under the supervision of my father Surinderpal Singh ji. He has done Kirtan at Sri Darbar Sahib and Takht Kesgarh Sahib. He also has a Masters in music with an emphasis on Indian Classical. He started an non-profit organization known as Guru Teg Bahadur Mission Sahara and under that organization started an Academy known as Vismaad Academy. I learned Gurmat Sangeet from Vismaad Academy where my Father was the teacher. In 2014, I also started to learn Tanti saaz including dilruba and taus. What motivated you to learn gurmat sangeet? At home I was always exposed to a kirtan environment as my father has a strong background in kirtan. I was always fond of singing and hearing kirtan at home would only make my connection to music stronger. It wasn’t until the first time I heard classical Shabads from my father that I was really interested. It caught my attention as it was different compared to the light kirtan and I wanted to know what that was! That grabbed my attention to such an extent that I started rigorously learning classical kirtan. How long did the 62 raags CDs take to compile? How did you select the shabads? I started working on this project in spring of 2014. The entire process took two years to complete. I selected shabads from each raags that would be unique in some way or another. My goal was to show different styles of kirtan from dhrupad to light classical style to classical style to partaals. I would thoroughly look at each raag and selected shabads that would be either very easy in making the message clear or would be uncommonly heard shabads. With that goal in mind, I selected the shabads and began composing. What considerations did you keep in mind in making the compositions? When making the composition I had several things in mind; I wanted to emphasize the message, show the saroop of the raags, and show different styles that kirtan has evolved through over time. 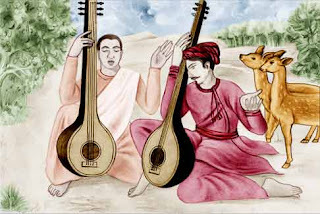 Many of the light compositions were based off of the style that is commonly heard today in light kirtan, however they still maintain the saroop of the raags. The taals I selected varied from common taals such as Dadra (6 beats), Deepchandi (14 beats), Teentaal (16 beats), to the more complex and aprachalit taals in nature such as Rupam (8.5 beats), Frodast (14 beats), Chartaal ki swari (11 beats). These combinations of prachalit and aprachalit taals played a very big role in making each composition distinct. Another thing I kept in mind was that many raags have partaals written in them, so to preserve the style of partaals we recorded many partaals in this project. While we did not cover every partaal we did do partaals in raags such as Kanra, Sarang, Prabhati Bhibas, Malhar, etc. How did you compile the 62 RAAGS? The 62 raags are divided into 9 VOLUMES. Each recording is on average 10 minutes which would mean the 62 raags are easily over 8 hours. That would be impossible to compile in a single CD. Volumes 1-7 and volume 9 all have 7 tracks each and volume 8 has 6 tracks. The raags in each volume are listed in the same order as they appear in SGGS ji. I am a pre-med Student at UC Riverside and while devoting time to education I still take out time to practice kirtan. My goal is to inspire our future generations to partake their role in preserving our rich culture. With this CD I want to motivate the youth to get more in touch with gurmat sangeet . I want to inspire the youth by having an established educational background while still devoting time to gurmat sangeet to allow them to feel that it is possible to still be able to take out time for gurbani while being consumed with daily obligations. Can you tell us who all has helped in the project? And where can we obtain the 62 RAAGS CDs? A lot of effort was put into this project by not only myself but our very talented Tabla vadaks including Tarnpreet Singh, Amrit Singh, and my brother Sukhwinder Singh. Sukhwinder Singh, who is a disciple of the well renowned Tabla maestro Pt. Swapan Chaudhury, recorded Tabla on majority of the shabads and demonstrated excellent musicianship. His ability to perform complex chakardars, relas, and tukras in very complex taals are worth appreciating. I am very thankful to these Tabla vadaks for accompanying me. On the final note I would just like to say that this project is way for us to give back to our community. Our intentions with this project are to preserve the tradition of gurmat sangeet. This project is indeed a very unique one, first of its kind out of India; so I hope that the sangat will find it appreciable. The CDs will be released on the 11th of September and copies can be obtained in person as of that date. We are currently working to make it available for sangat to order online so it will be available to order online soon after the release. The details can be provided upon completion. Amazing that this is being done in the US. We should all learn from Bhai Harlove Singh! Bhaaji ... very nice. Where can I get these CDs? Can you please let us know??? ?